The Psocoptera fauna of Gorgona National Natural Park, Colombian pacific, consists of 75 species in 42 genera and 21 families. 1 730 specimens were collected in the period November 2007-June 2011. Five families, 20 genera and nine species are new records for Colombia, and two genera and ten species are new to science. The psocid fauna of the island constitutes an extension of the continental fauna. Rev. Biol. Trop. 62 (Suppl. 1): 243-256. Epub 2014 February 01. Key words: Pacific coast, Colombia, natural national parks, species list. La fauna de Psocoptera (Psocodea) del Parque Nacional Natural Gorgona, consiste de 75 especies en 42 géneros y 21 familias. 1 730 especimenes fueron recolectados en el periodo entre noviembre de 2007 y junio de 2011. Cinco familias, 20 géneros y nueve especies son nuevos registros para Colombia, y dos géneros y diez especies son nuevos para la ciencia. La fauna de Psocoptera de la isla constituye una extensión de la fauna continental. Palabras clave: Costa del Pacífico, Colombia, los parques nacionales naturales, la lista de especies. Psocids (Psocodea: ‘Psocoptera’), are small, neopterous, exopterygote insects, characterized by having filiform antennae, bulbous postclypeus, asymmetric mandibles, and maxillae with elongate, free laciniae; the wings are membranous, with simple venation, in most species placed roof-like over the dorsum; apterism and brachypterism are frequent, and the tarsi are 2-3 segmented in the adults and always 2 segmented in the nymphs. For general information on the biology of these insects, see Badonnel (1951), Lienhard (1998), Mockford (1993) and New (1987). For relationships within the order Psocodea, see Bess, Smith, Lienhard & Johnson (2006). They are essentially wild, free living insects that constitute part of the aerial plankton (Simberloff & Wilson, 1969), and represent a significant fraction of the biomass in temperate forests (Thornton, 1985); they are probably key organisms in the trophic network of many ecosystems, as they are prey of many vertebrates and invertebrates, and they are primary consumers, feeding on algae, lichens, mycelia that grow on foliage, tree trunks and rock surfaces, and occasionally on pollen grains (Lienhard, 1998). They are found in living and dead foliage, leaf litter, cortex of trees and shrubs, rock surfaces and human habitations (Mockford, in prep., García-Aldrete, 1990). It is a diverse group, with more than 5 500 species, in more than 435 valid genera, and more than 40 families (García-Aldrete, 2006). They have been found all over the world, being particularly species rich in the tropics (García-Aldrete, 1988). In Colombia, only a few species have been recorded so far (87 species), but being a megadiverse country, we anticipate that its psocid richness will be comparable to the richness of other neotropical countries, although for most of them the inventory is rather incomplete (see García-Aldrete, 2008, for a list of Mexican Psocoptera, and García-Aldrete & Mockford, 2009, for a list of Brazilian Psocoptera). The Pacific islands of Gorgona and Gorgonilla presently constitute the National Natural Park (NNP) Gorgona, a protected area in Colombia that was strongly altered anthropogenically in the past, on account of the establishment there of a high security prison, cancelled in 1984. It constitutes a representative area of highly humid tropical forest in the biogeographic Colombian Chocó, quite diverse biologically. 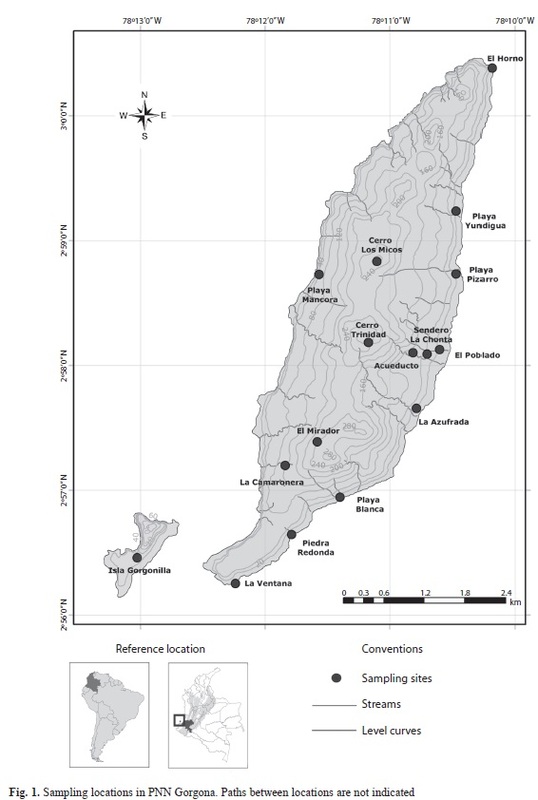 The arthropods in general have been little studied, and in this work we present a preliminary list of Psocoptera, with information on the habitats where they have been found, resulting from field work in the NNP Gorgona, between 2007 and 2011. The NNP Gorgona belongs to the municipality of Guapi (2°47’-3°6’ N, 78°6’-78°18’ W), Department of Cauca, in the south of the Colombian Pacific; it includes the islands of Gorgona and Gorgonilla, with an area of 13.8Km2 and with altitudes from 0 to 338m at Cerro Trinidad (Chamorro, 1990). It presents, as average annuals: temperature 26°C, relative humidity 90%, solar brightness 989.5h, precipitation 6 891.4mm and evaporation 900.2mm (Rangel & Rudas, 1990). The specimens were taken directly from the substrate, by beating vegetation, by sweeping with a soft brush (3-4 inches wide), tree trunks and rock surfaces, and by sifting leaf litter; the specimens were taken in beating cloths of about 60x60cm, or in plastic, rectangular trays (25x40x10cm), and transferred to containers with 80% ethyl alcohol, utilizing mouth aspirators. Malaise, Shannon and led light traps were also utilized, placing the latter near the canopy, at heights of 15 and 20m. For the identification, it was necessary to dissect the specimens and mount their parts permanently on slides in Canada balsam (see García-Aldrete, 1990 and González-Obando, García-Aldrete & Carrejo, 2011). Table 1 lists the coordinates, altitudes and abbreviations for the collecting localities (Fig. 1) noted for each species. 1 730 specimens were taken, in which 75 species of Psocoptera are represented, in 42 genera and 21 families; six families, 21 genera and 20 species constitute new records for the Colombian fauna, at least ten species are new to science, three of which have just been recently described (García-Aldrete, Gonzalez & Sarria-S 2011). The most diverse family is Psocidae, with eight genera and 18 species, followed by Lepidopsocidae, with five genera and six species; the most speciose genera are Ectopsocus (eight species), Valenzuela (six species), and Blastopsocus (five species); six genera are represented by two species, and 25 genera are represented by one species. Table 2 summarizes densities and the different habitats where the species were collected. Records: A1, A4, A8, A11, A13, A14, A15, A16, A17, 12-17.XI.2007, canopy fogging, 30 ♀♀. S.PB, 25.XI.2009, beating foliage, 2 ♀♀. S.PB, 25.XI.2009, in leaf litter, 3 ♀♀. S.FGll, 26.XI.2009, beating foliage, 2 ♀♀. Pd, 24.XI.2009, beating foliage, 91 ♀♀. S.Ch, 21.XI.2009, beating foliage, 6 ♀♀. PGll, 26.XI.2009, on palm trunk and foliage, 12 ♀♀. PB, 19.X.2010, beating foliage, 17 ♀♀. S.PB, 19.X.2010, beating foliage, 1 ♀. PGll, 16.X.2010, beating foliage, 12 ♀♀. PP, 17.X. 2010, beating foliage, 17 ♀♀. Pd, 22.X.2010, beating foliage, 1 ♀. S.Ch, 18.X.2010, beating foliage, 10 ♀♀. S.Ch, 23.X.2010, beating foliage, 7 ♀♀. PP, 24.II.2011, beating foliage, 3 ♀♀. S.PB, 26.II.2011, beating foliage, 5 ♀♀. PGll, 22.II. 2011, beating foliage, 5 ♀♀. PCa, 23.II.2011, beating foliage, 5 ♀♀. Records: S.PB, 25.XI.2009, on dead leaves, 1 ♀. PGll, 26.XI.2009, on palm trunk, 20 ♀♀. Pd, 24.XI.2009, beating foliage, 4 ♀♀. PB, 19.X. 2010, beating foliage, 12 ♀♀. PGll, 16.X.2010, beating foliage, 87 ♀♀. PP, 17.X.2010, beating foliage, 99 ♀♀. Pd, 22.X.2010, beating foliage, 1 ♀. S.Ch, 18.X.2010, beating foliage, 4 ♀♀. PGll, 22.II.2011, beating foliage, 6 ♀♀. PP, 22.II.2011, beating foliage, 2 ♀♀, 2 ♂♂. P.Ca, 23.II.2011, beating foliage, 1 ♀. PP, 24.II.2011, beating foliage, 18 ♀♀, 7 ♂♂. Records: PGll, 26.XI.2009, beating foliage, 1 ♀. S.Ch, 23.XI.2009, beating foliage, 1 ♀. Pd, 24.XI.2009, beating foliage, 3 ♀♀. PP, 17.X.2010, beating foliage, 2 ♀♀. PB, 19.X.2010, beating foliage, 7 ♀♀. PP, 23.II.2011, light trap, 3 ♀♀. Records: S.PB, 25.XI.2009, in leaf litter, 2 ♀♀. PP, 17.X.2010, beating foliage, 1 ♀. PP, 24.II.2011, beating foliage, 1 ♀. Records: S.Ch, 23.XI.2009, beating foliage, 1 ♀. S.Ch, 21.XI.2009, beating foliage, 1 ♀. PP, 24.II.2011, beating foliage, 1 ♀. Records: Pd, 26.XI.2009, on house wall, 4 ♀♀. Pd, 24.XI.2009, beating foliage, 1 ♀. Pd, 21.XI.2009, on window wood frame, 4 ♀♀. Pd, 22.XI.2009, on wooden box, 34 ♀♀. Pd, 22.X.2010, on house wall, 13 ♀♀, 6 ♂♂. S.PY, 25.II.2011, beating foliage, 1 ♀. Records: A1, 12.XI.2007, canopy fogging, 1 ♀. Pd, 23.XI.2009, on house wall, 1 ♀. Records: A11, 14.XI. 2007, canopy fogging, 2 ♂♂. Records: FGll, 26.XI.2009, on iron bar, 4 ♀♀. Record: QC, 29.VI-2.VII.2011, led light trap, 8 ♀♀. Records: S.Ch, 23.XI.2009, beating foliage, 1 ♀. S.Ch, 18.X.2010, beating foliage, 2 ♀♀. Records: S.Ch, 21.XI.2009, beating foliage, 1 ♀, 2 ♂♂. P.Gll, 22.II.2011, on tree trunk, 1 ♀, 2 ♂♂. P.Ca, 23.II.2011, on tree trunk, 5 ♀♀, 7 ♂♂. Records: Pd, 7.XI.2009, on house wall, 1 ♀, 1 ♂. Pd, 21.XI.2009, on house wall, 2 ♀♀, 1 ♂. Pd, 22.XI.2009, on wooden box, 6 ♂♂. Pd, 24.XI.2009, on palm fronds roof, 1 ♀. Pd, 26.XI.2009, on wooden box, 1 ♀, 2 ♂♂. Pd, 22.XI.2010, on house wall, 3 ♀♀, 1 ♂. Record: PB, 19-22.X.2010, Malaise trap, 1 ♂. S.PY, 20-22.X.2010, Malaise trap, 1 ♂. PR, 23-25.II.2011, Malaise trap, 1 ♂. S.PB, 26.II.2011, in leaf litter, 1 ♂. Record: PB, 19-22.X.2010, Malaise trap, 1 ♂. CT1, 26.II.2011, led light trap, 1 ♂. Records: PP, 24-25.II.2011, led light trap, 2 ♂♂. PP, 27.II.-1.III.2011, light trap, 1 ♂. Records: PP, 22-23.II.2011, led light trap, 1 ♂. PP, 24.II.2011, light trap, 3 ♂♂. PY, 27.III.2011, led light trap, 1 ♂. CMr, 28-29.V.2011, led light trap, 1 ♂. Records: CT1, 27.II.-1.III.2011, led light trap, 5 ♂♂. CT, 27.II.-1.III.2011, led light trap, 1 ♂. Records: A13, 16.XI.2007, canopy fogging, 1 ♂. PB, 19-22.X.2010, Malaise trap, 1 ♂. CT1, 27.II.2011, light trap, 5 ♂♂. PP, 23.II.2011, light trap, 3 ♂♂. S.PY, 23.II.2011, light trap, 1 ♂. CMr, 24-25.V.2011, light trap, 2 ♂♂. CM, 28-29.V.2011, light trap, 2 ♂♂. S.PY, 17.II.-2.III.2011, light trap, 1 ♂. Records: A8, A14, 16.XII.2007, canopy fogging, 3 ♀♀. PR, 23-25.II. 2011, Malaise trap, 1 ♀. S.PB, 26.II.2011, 1 ♀. CMr, 24-25.V.2011, led light trap, 1 ♀; Malaise trap, 2 ♂♂. Records: S.PB, 23-25.II.2011, Malaise trap, 1 ♀. S.PB, 26.II.2011, in leaf litter, 3 ♀♀, 1 ♂. S.PB, 27.II.2011, in leaf litter, 6 ♀♀, 4 ♂♂. PY, 27.II.-2.III.2011, led light trap, 2 ♂♂. CMr, 24-25.V.2011, led light trap, 4 ♂♂. Records: A14, 16.XI.2007, canopy fogging, 1 ♀. Records: A1, A3, A10, A15, A16, 12-17.XI.2007, canopy fogging, 3 ♀♀, 2 ♂♂. CMr, 24-25.V.2011, led light trap, 3 ♂♂. CT2, 26-27.V. 2011, led light trap, 3 ♂♂. Records: S.Ch, 21 and 23.XI.2009, beating foliage, 2 ♂♂. Pd, 24 and 26.XI. 2009, beating foliage, 26 ♀♀, 17 ♂♂. PP, 17.X.2010, beating foliage, 1 ♀. S.Ch, 18 and 23.XI.2010, beating foliage, 3 ♀♀, 1 ♂. S.Ch, 18-22.X.2010, Malaise trap, 1 ♂. S.PB, 19.X.2010, beating foliage, 6 ♀♀, 6 ♂♂. PB, 19.X.2010, beating foliage, 4 ♀♀, 2 ♂♂. PP, 22.II.2011, beating foliage, 1 ♂. S.PB, 26 and 28.II.2011, beating foliage, 2 ♀♀, 1 ♂. PH, 24.V.2011, beating foliage, 1 ♀. Records: A9, A10, A13, A16, 14.XI.2007, canopy fogging, 7 ♀♀, 4 ♂♂. Pd, 24.XI.2009, beating foliage, 10 ♀♀, 3♂♂. PP, 23.II.2011, beating foliage, 2 ♀♀. S.PB, 28.II.-1.III.2011, light trap, 1 ♂. CMr, 24-25.V.2011, light trap, 14 ♀♀, 7 ♂♂. CM, 28-29.V.2011, light trap, 2 ♀♀. CT1, 26-27.V.2011, light trap, 1 ♀. Records: A1, 12.XI.2007, canopy fogging, 1 ♂. A8, 14.XI.2007, canopy fogging, 1 ♀. Pd, 24.XI.2009, beating foliage, 5 ♀♀, 1 ♂. Pd, 26.XI.2009, beating foliage, 1 ♀. Pd, 22.X.2010, on house wall, 1 ♂. Acd, 26.II.-1.III.2011, Malaise trap, 1 ♂. Records: Pd, 26.XI.2009, beating foliage, 1 ♀. PP, 17.X.2010, beating foliage, 1 ♀. Records: PP, 23.II.2011, beating foliage, 1 ♂. CMr, 24-25.V.2011, led light trap, 1 ♀, 4 ♂♂. CM, 28-29.V.2011, led light trap, 1 ♂. Record: A15, 17.XI.2007, canopy fogging, 3 ♀♀, 1 ♂. Record: S.Ch, 21-22.X.2010, led light trap, 1 ♂. S.Ch, 23.X.2010, beating foliage, 2 ♀♀, 1 ♂. Records: S.PB, 19.X.2010, 2 ♀♀, 1 ♂. PP, 23.II.2011, beating foliage and led light trap, 1 ♀, 2 ♂♂. CT1, 27.II.-1.III.2011, led light trap, 1 ♀, 1♂. CMr, 24-25.V.2011, led light trap, 1 ♀. PR, 26.II.2011, beating foliage, 1 ♀. Acd, 25-26.V.2011, led light trap, 1 ♂. CT2, 26-27.V.2011, led light trap, 2 ♂♂. Records: PGll, 16.X.2010, beating foliage, 5 ♀♀, 4 ♂♂. S.PB, 25.XI.2009, in leaf litter, 2 ♀♀. S.FGll, 26.XI.2009, in leaf litter, 1 ♀. PGll, 26.XI.2009, beating foliage, 5 ♀♀. PB, 19.X.2010, beating foliage, 1♀. Records: PGll, 26.XI.2009, on palm trunk, 32 ♀♀, 30 ♂♂. PGll, 16.X.2010, beating foliage, 7 ♀♀, 7 ♂♂. Records: PGll, 26.XI.2009, on palm trunk, 1 ♀. Pd, 21.XI.2009, beating foliage, 5 ♀♀. PGll, 16.X.2010, beating foliage, 9 ♀♀, 14 ♂♂. PCa, 23.II. 2011, beating foliage, 1 ♀. Records: PGll, 16.X.2010, beating foliage, 1 ♂. S.PB, 19.X.2010, beating foliage, 6 ♀♀, 6 ♂♂. Records: Pd, 24.XI.2009, beating foliage, 5 ♀♀, 3 ♂♂. PGll, 26.XI.2009, on tree trunk, 1 ♀. PP, 17.X.2010, beating foliage, 2 ♀♀, 2 ♂♂. PB, 19.X.2010, beating foliage, 1 ♂. PP, 24.II.2011, beating foliage, 2 ♀♀. Records: CMr, 24-25.V.2011, led light trap, 1 ♂. Records: PP, 23.II.2011, light trap, 1 ♀. Record: S.Ch, 6.VII.2011, on tree trunk with ant’s nest, 2 ♀♀. Records: A11, 14.XI.2007, canopy fogging, 2 ♀♀. A16, 17.XI.2007, canopy fogging, 2 ♂♂. Pd, 22.XI.2009, beating foliage, 5 ♀♀. Pd, 24.XI. 2009, beating foliage, 4 ♀♀. PGll, 26.XI.2009, beating foliage, 1 ♀. PGll, 16.X.2010, beating foliage, 1 ♀. PP, 24.II.2011, led light trap, 1 ♂. Records: CMr, 24-25.V.2011, led light trap, 1 ♀, 3 ♂♂. S.PB, 27.II.-.III.2011, led light trap, 1 ♂. CT1, 27.II.-2III.2011, led light trap, 3 ♂♂. CM, 28-29.V.2011, led light trap, 2 ♂♂. Records: PP, 23.II.2011, beating foliage, 1 ♂. Acd, 25-26.V.2011, led light trap, 3 ♂♂. CT1, 27.II.-2.III.2011, led light trap, 2 ♂♂. CM, 28-29.V.2011, led light trap, 1 ♂. Records: S.PB, 26.II.2011, beating foliage, 1 ♀. S.PB, 28.II.2011, beating foliage, 1 ♂. S.PP, 24-25.II.2011, led light trap, 2 ♂♂. Records: PP, 23.II.2011, beating foliage, 1 ♂. S.PB, 28.II.-1.III.2011, led light trap, 5 ♂♂. CM, 28-29.V.2011, led light trap, 2 ♂♂. Records: A14, A15, 17.XI.2007, canopy fogging, 2 ♀♀. Pd, 24.II.2009, beating foliage, 3 ♀♀. PGll, 26.XI.2009, beating foliage, 1 ♀. PP, 17.X. 2010, beating foliage, 1 ♀. PP, 23.II.2011, beating foliage, 2 ♀♀. Records: A4, 13.XI.2007, canopy fogging, 1 ♀. A5, A11, 14.XI.2007, canopy fogging, 2 ♀♀. A16, 17.XI.2007, canopy fogging, 6 ♀♀. S.Ch, 23.XI. 2009, beating foliage, 2 ♀♀. Pd, 24.XI.2009, beating foliage, 10 ♀♀. PGll, 26.XI.2009, on palm trunk, 2 ♀♀. PGll, 16.X.2010, beating foliage, 7 ♀♀, 2 ♂♂. PB, 19.X.2010, beating foliage, 1 ♀. S.PB. 23.II.2011, in leaf litter, 1 ♂. S.PB. 28.II.2011, in beating foliage, 1 ♀. Records: PGll, 16.X.2010, beating foliage, 11 ♀♀, 12 ♂♂. PGll, 16-18.X.2010, Malaise trap, 1 ♀. PP, 17.X.2010, beating foliage, 2 ♀♀, 3 ♂♂. Records: A1, 12.XI.2007, canopy fogging, 1 ♀. Pd, 24.XI.2009, beating foliage, 5 ♀♀. Pd, 26.XI.2009, beating foliage, 1 ♀, 3 ♂♂. PGll, 26.XI. 2009, beating foliage, 4 ♀♀. PGll, 16.X.2010, beating foliage, 32 ♀♀, 17 ♂♂. PP, 17.X.2010, 30 ♀♀, 22 ♂♂. S.Ch, 18.X.2010, 1 ♀, 2 ♂♂. PB, 19.X.2010, beating foliage, 1 ♂. PP, 24.II.2011, beating foliage, 4 ♂♂. Records: A1, 12.XI.2007, canopy fogging, 3 ♀♀. A10, 14.XI.2007, canopy fogging, 1 ♀. Pd, 24.XI.2009, beating foliage, 2 ♀♀. PGll, 26.XI. 2009, beating foliage, 4 ♀♀. PP, 17.X.2010, beating foliage, 2 ♀♀. Records: A1, 12.XI.2007, canopy fogging, 4 ♀♀. A2, A3, 13.XI.2007, canopy fogging, 5 ♀♀, 3 ♂♂. A8, A10, A11, 14.XI.2007, canopy fogging, 2 ♀♀, 1 ♂. A14, A15, A16, 17.XI.2007, canopy fogging, 6 ♀♀, 2 ♂♂. PGll, 16.X.2010, beating foliage, 4 ♀♀. PP, 17.X.2010, beating foliage, 5 ♀♀. S.Ch, 18-19.X.2010, led light trap, 3 ♂♂. PB, 19.X.2010, beating foliage, 1 ♀. S.Ch, 21-22.X.2010, these, and the following specimens, taken in led light traps, 4 ♂♂. PP, 23.II.2011, 1 ♂. S.PP, 24-25.II.2011, 1 ♂. PY, 27.II.-1.III. 2011, 1 ♂. CT1, 28.II.-2.III.2011, 1 ♂. PY, 28.II.-1.III.2011, 1 ♂. CMr, 24-25.V. 2011, 9 ♂♂. Acd, 25-26.V.2011, 4 ♂♂. CT2, 26-27.V.2011, 2 ♂♂. CM, 28-29.V. 2011, 3 ♂♂. Records: A3, 13.XI.2007, canopy fogging, 2 ♀♀, 1 ♂. A11, 14.XI.2007, canopy fogging, 5 ♀♀. A14, 16.XI.2007, canopy fogging, 1 ♀. PGll, 17.X. 2010, beating foliage, 1 ♂. PP, 17.X.2010, 1 ♀, 1 ♂. PP, 23.II.2011, light trap, 4 ♀♀, 2 ♂♂. PGll, 22.II.2011, beating foliage, 1 ♀. Records: PGll, 26.XI.2009, beating foliage, 18 ♀♀, 6 ♂♂. PGll, 16.X.2010, beating foliage, 1 ♀. PB, 19.X.2010, beating foliage, 1 ♂. Records: A11, 14.XI.2007, canopy fogging, 1 ♀. A13, 16.XI.2007, canopy fogging, 1 ♀. A15, 17.XI.2007, canopy fogging, 3 ♀♀. PP, 17.X.2010, beating foliage, 3 ♀♀, 1 ♂. PB, 19.X.2010, beating foliage, 3 ♀♀, 1 ♂. PB, 19-22.X.2010, 1 ♂. S.Ch, 21-22.X.2010, led light trap, 1 ♀. Records: A11, 14.XI.2007, canopy fogging, 1 ♀. A15, 17.XI.2007, canopy fogging, 1♀. Records: A4, 13.XI.2007, canopy fogging, 1 ♀. A11, 14.XI.2007, canopy fogging, 2 ♀♀. PP, 23.II.2011, led light trap, 1 ♀, 1 ♂. CT1, 27.II.-1.III.2011, led light trap, 2 ♂♂. CMr, 24-31.V.2011, Malaise trap, 1 ♂. CM, 28-29.V.2011, led light trap, 1 ♂. Records: A5, 14.XI.2007, canopy fogging, 1 ♀. S.Ch, 21-22.X.2010, led light trap, 1 ♂. PGll, 22.II.2011, beating foliage, 7 ♀♀, 3 ♂♂. CMr, 24-25.V.2011, led light trap, 1 ♀. Records: PP, 22.II.2011, beating foliage, 1 ♀. PP, 23.II.2011, led light trap, 1 ♂. CT1, 27.II.2011, led light trap, 2 ♂♂. Records: A11, 14.XI.2007, canopy fogging, 1 ♂. A14, 17.XI.2007, canopy fogging, 1 ♂. Acd, 25-26.V.2011, led light trap, 1 ♂. CM, 28-29.V.2011, led light trap, 2 ♂♂. Records: A13, 14.XI.2007, canopy fogging, 4 ♀♀. A15, 17.XI.2007, canopy fogging, 1 ♀. Records: A11, 14.XI.2007, canopy fogging, 1 ♀. A15, 17.XI.2007, canopy fogging, 2 ♂♂. Pd, 24.XI.2009, beating foliage, 14 ♀♀. PP, 17.X. 2010, beating foliage, 9 ♀♀, 2 ♂♂. S.Ch, 18-19.X.2010, led light trap, 3 ♂♂. S.Ch, 21-22.X.2010, led light trap, 1 ♀, 9 ♂♂. PB, 19.X.2010, beating foliage, 1 ♂. S.PY, 20.X.2010, led light trap, 2 ♂♂. PP, 23.II. 2011, led light trap, 1 ♂. S.PP, 24-25.II.2011, led light trap, 1 ♂. S.PB, 26.II.2011, beating foliage, 1 ♀. PY, 27.II.-1.III.2011, led light trap, 4 ♂♂. CT1, 27.II.-1.III.2011, led light trap, 2 ♂♂. S.PB, 28.II.-1.III. 2011, led light trap, 18 ♂♂. CMr, 24-25.V.2011, led light trap, 3 ♂♂. Acd, 25-26.V.2011, led light trap, 1 ♂. CM, 28-29.V.2011, led light trap, 4 ♂♂. Record: PB, 19-22.X. 2010, Malaise trap, 1 ♂. Records: A15, A16, 17.XI.2007, canopy fogging, 5 ♀♀. S. PB, 24.II.2011, direct capture, 1 ♀. S.PY, 27.II.2011, direct capture, 1 ♀. CT1, 27.II.-1.III.2011, led light trap, 3 ♀♀, S.PB, 1 ♀. Records: A15, 17.XI.2007, canopy fogging, 1 ♂. CT1, 27.II.-1.III.2011, led light trap, 2 ♂♂. PY, 27.II.-1.III.2011, led light trap, 1 ♂. S.PB, 28.II.-1.III.2011, led light trap, 2 ♂♂. Records: S.FGll, 26.XI.2009, beating foliage, 4 ♀♀, 1 ♂. PGll, 22.II.2011, in leaf litter, 1 ♂. CMr, 24.V.2011, direct capture, 1 ♀. Records: A1, 12.XI.2007, canopy fogging, 1 ♂. A13, 16.XI.2007, canopy fogging, 4 ♀♀. CMr, 24-25.V.2011, led light trap, 1 ♀, 3 ♂♂. CM, 28-29.V.2011, led light trap, 1 ♂. Records: A15, 17.XI.2007, canopy fogging, 1 ♂. PP, 23.II.2011, light trap, 1 ♀, 1 ♂. CT1, 27.II.-1.III.2011, led light trap, 1 ♂. PY, 27.II.-1.III.2011, led light trap, 1 ♂. CMr, 24-25.V.2011, light trap, 5 ♀♀, 7 ♂♂. CM, 28-29.V.2011, led light trap, 3 ♂♂. Records: A3, 13.XI.2007, canopy fogging, 1 ♂. A11, 14.XI.2007, canopy fogging, 1 ♀. Records: S.Ch, 18.X.2010, beating foliage, 1 ♂. CT1, 28.II.2011, led light trap, 2 ♂♂. Records: A2, 13.XI.2007, canopy fogging, 1 ♂. CM, 28-29.V.2011, light trap, 1 ♂. Records: A8, A11, 14.XI.2007, canopy fogging, 1 ♀, 1 ♂. A15, 17.XI.2007, canopy fogging, 1 ♂. Records: A2, A3, 13.XI.2007, canopy fogging, 2 ♀♀, 3 ♂♂. A13, 16.XI.2007, canopy fogging, 2 ♀♀. A14, A16, 17.XI.2007, canopy fogging, 3 ♀♀. PP, 23.II.2011, these and the following specimens taken in led light traps, 4 ♀♀. PP, 24.II.2011, 1 ♀. S.PP, 24-25.II.2011, 1 ♀. CT1, 27.II.-1.III.2011, 5 ♀♀, 1 ♂. S.PB, 28.II. 2011, 2 ♀♀, 1 ♂. CMr, 24-25.V.2011, 2 ♀♀, 2 ♂♂. Acd, 25-26.V.2011, 2 ♀♀. PY, 27.II.-1.III.2011, 1 ♀. Records (all taken in led light traps): PP, 23.II.2011, 1 ♂. CMr, 24-25.V.2011, 6 ♀♀, 3 ♂♂. CM, 28-29.V.2011, 3 ♀♀, 1 ♂. Records: PB, 19.X.2010, beating foliage, 2 ♀♀. PB, 19-22.X.2010, Malaise trap, 1 ♂. S.PB, 28.II.2011, led light trap, 1 ♀. CMr, 24-25.V. 2011, led light trap, 9 ♀♀, 19 ♂♂. CM, 28-29.V.2011, led light trap, 1 ♀. Records: CMr, 24-25.V.2011, led light trap, 12 ♀♀, 41 ♂♂. CT2, 26-27.V.2011, led light trap, 1 ♀, 1 ♂. Record: CMr, 24-25.V.2011, led light trap, 1 ♀. The distribution of the abundance of the species found follows the usual pattern of a few species represented by many individuals, many species represented by one or few individuals, and a middle group of species with intermediate values (Table 3). Given the close proximity of Gorgona Island to the mainland, separated by only 35km, it is not surprising that the species richness be quite high; in comparison with other islands in the Mexican Pacific is meaningful, as it shows that, according to the theory of island biogeography (MacArthur & Wilson, 1967), small islands have fewer species than large islands, and distant islands have fewer species than close islands to the mainland (Table 4, García-Aldrete, 1986; García Aldrete, Cadena-Carrión & Cervantes-Peredo, 1992); unfortunately, we still do not have a good psocid census of the mainland near the NNP Gorgona, but the evidence we have indicates that, most probably, the level of endemism is low, so far with only Lepolepis sp., Goja sp., the three species of Loneura, the genus ca. Kaestneriella, and the new genus of Psocidae as probable endemics to NNP Gorgona, so it would seem that the island fauna is an extension of the continental fauna. An interesting feature of the fauna, comparing it with the other Pacific islands, is that only one species, the widely distributed Pseudocaecilius citricola (Ashmead), is shared among the five islands (Table 4). Of particular interest are the records of Lepidopsocus pretiosus Banks and Nepticulomima hoesemanni Enderlein in the NNP Gorgona; the former was known from Guam, Micronesia, Christmas Island, Indonesia, Melanesia and Polynesia, and the latter was known from several African countries and from Christmas Island, and was recently recorded at the Waorani Ethnic Reserve, in Napo, Ecuador (Lienhard & Smithers, 2002; García-Aldrete, 2001). The most abundant species were Echmepteryx madagascariensis (Kolbe), E. falco Badonnel, and Heterocaecilius sp., that together, account for 35.6% of the specimens collected. The first two are pantropical, and are among the first colonizers of secondary vegetation in the Pacific (Thornton, 1985), which may explain their presence and abundance in the NNP Gorgona. They were found throughout the island, but were most abundant at the beaches and near the small town, where the density of coconut palms is high; this agrees with the finding of Thornton et al. (1988), on Java, Indonesia, where they found lepidopsocids mostly on dead palm fronds. The diversity of Psocoptera in the biogeographic Chocó is unknown, but upon comparing the genera found in the NNP Gorgona, with those recorded in Colombia, we found an index of faunistic similarity of 42%, meaningful but preliminary, and likely to go down, as the Colombian fauna gets to be better known. Also, upon comparing Fisher’s α diversity index for the psocids of the NNP Gorgona, with the values for other areas (Table 5), such as Fortuna, Panama, and the Krakatau archipelago, with areas of 195 and 25.4Km2 respectively, we found a relatively high value, given the small area of the NNP Gorgona (13.8Km2). In Colombia, 21 families, 42 genera and 87 species have been recorded (Lienhard & Smithers, 2002; García-Aldrete et al., 2011a; García-Aldrete, González & Sarria-S, 2011; González et al., 2011). Accordingly, families Asiopsocidae, Compsocidae, Hemipsocidae, Myopsocidae and Stenopsocidae constitute new records for the country, raising to 26 the number of families for the country. The genera Cladiopsocus, Echmepteryx, Epipsocus, Graphopsocus, Hemipsocus, Heterocaecilius, Kaestneriella, Lepidopsocus, Lichenomima, Mesepipsocus, Myopsocus, Nepticulomima, Notiopsocus, Pararchipsocus, Proentomum, Ptycta, Scytopsocus, Seopsocus, Thyrsopsocus and Trichadenotecnum raise to 62 the number of genera for the country; in addition, we found two genera and ten species new to science. In summary, the psocid fauna of the NNP Gorgona requires further study, to identify to species level, and to verify which of the species are undescribed. The rich psocid fauna of the NNP Gorgona, as compared to the psocid fauna of other Pacific islands, particularly the Mexican Tres Marías and Revillagigedo archipelagos, and the closeness to the continent, indicates that its fauna is an extension of the continental fauna. To ascertain the point above requires a psocid survey of the continental fauna in the area closest to the NNP Gorgona. FSS and RGO are grateful to the Departamento de Biología, Universidad del Valle, for research support. ANGA thanks Instituto de Biología, Universidad Nacional Autónoma de México for research support over the years. We also wish to thank Andrew Mason and Fernando Montealegre-Z., for allowing us to study the material collected by them during the development of their project in the NNP Gorgona (research permit No. DTSO-G-31); we are grateful to the Administration and personnel of the NNP Gorgona Island, and to Alan Giraldo, head of the Project “Evaluation of the present status of the subjects of faunistic conservation in Gorgona Island” (research permit No. PIBD DTSO 011-10). Julián Alexander Mendívil, Diana Marcela Torres Domínguez and Stephany Valdés-R., students of the Biology Department, Facultad de Ciencias Naturales y Exactas, Universidad del Valle, are especially thanked for their invaluable help and logistic support during field work in Gorgona Island. Recibido 18-X-2013. Corregido 20-XI-2013. Aceptado 19-XII-2013.